True to its name, Hoist Lakes Foot Travel Area is indeed a place for foot travel whether your feet are strapped to snowshoes or cross-country skis in the winter or are in hiking boots the rest of the year. 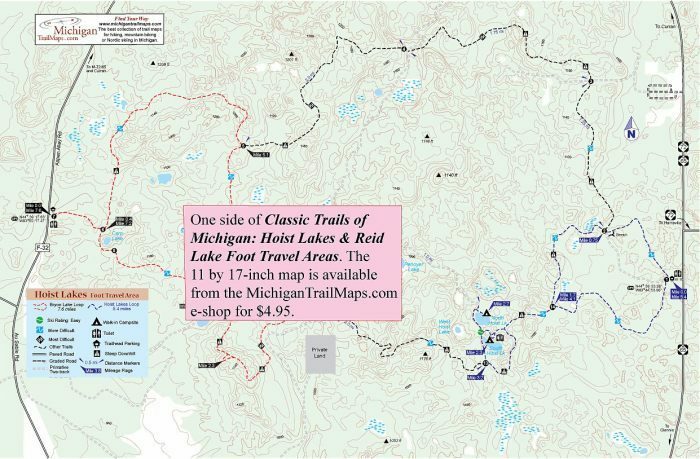 Banned from this 10,600-acre track of the Huron National Forest are mountain bikes, horses, motorized vehicles and boats with outboard motors. Set up in 1976 to provide a quiet oasis from our motorized society, Hoist Lakes is large enough to contain more than 20 miles of trails and a handful of walk-in campsites, making it the destination for two ideal backpacking outings for the weekend. Hoist Lakes East Loop begins from the eastern trailhead and described below is the Byron Lake Loop, a 6.5-mile loop from the western trailhead. Both are overnight treks where a spare day can be spent exploring more of the trail system or enjoying a little wilderness fishing along the lakes where you’ll be camping. The tract can be surprisingly rugged in places with many hills topping 1,200 feet in elevation. Hoist Lakes is covered by forests of pine, aspen, and other hardwoods that are broken up by seven named lakes and numerous ponds, marshes and beaver-flooded streams. Opportunities to observe wildlife are very good. Perhaps the most famous residents of the area are the least encountered ones: black bears. There is also red fox, mink, and coyotes, but more often than not the wildlife that hikers spot are wild turkeys, ruffed grouse, whitetail deer, beavers, porcupines, and a variety of waterfowl and birds. Backcountry camping and campfires are allowed anywhere in the tract as long as you’re at least 200 feet from an open body of water, swamp, or foot trail. But why bother? 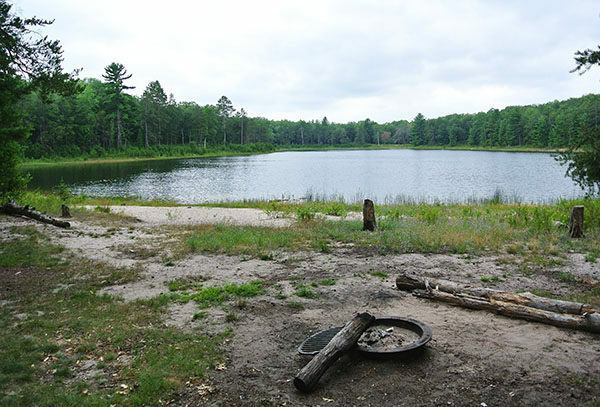 Some of the most beautiful walk-in campsites in the Lower Peninsula are located at Hoist Lakes and are usually so lightly used you won’t have to worry about snagging a spot to pitch your tent. It is a short, 1.7-mile walk to the Lake Byron campsites, ideal if you’re driving up after work on Friday. Most backpackers can be at the sites with their tents set up in less than an hour. You’ll find a vault toilet and a large information board at the western trailhead and a trail that departs east into a forest of mixed pines and hardwoods. Blue diamonds will keep you on track and in less than a half mile you’ll climb a small hill and gently descend to the first junction, marked by post No. 6. Head south (right) and through the trees you’ll spot Carp Lake on the east side of the trail. You pass the small, roundish lake from above and then swing east to arrive at post No. 8, marking where a hand pump was once located. You continue east, with the trail passing through a stand of predominantly maple that is magnificent in the fall, and then climb a ridge to gain more than 60 feet in elevation and top out in paper birch. From the stand of paper birch, you begin a long but gradual descent back into hardwoods, finally bottoming out at post No. 9 reached at Mile 1.7 near the north end of Byron Lake. One of the largest lakes in the area, Byron has panfish, perch, and a population of smallmouth bass but is tough to fish from the shoreline. 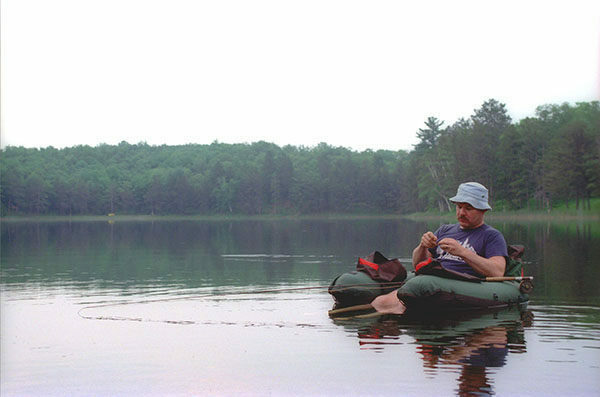 Since it’s not an easy portage for hauling in a canoe, some anglers attempt to fish the lake in waders, while others hike in with a float tube strapped to their backpacks. An unmarked path follows the west bank, while the main trail climbs away from the north end of the lake to quickly arrive at post No. 10. To the north (left) the trail heads for post No. 11 while to the east (right) the path is marked with a “Campsites” sign and quickly leads to three official campsites, many unofficial ones and two wilderness privies. One campsite is on the bluff above the lake and along with a fire ring and a bench features a long stairway down to the water. This is one of the best spots to pitch a tent in the entire Lower Peninsula, a place where you can spend an evening gazing out on Byron Lake and the forested ridges behind it. The trail continues to follow the ridge along the east shore, passing views of Byron Lake below. Eventually you descend past an old two-track, climb away from the lake, descend again, and then begin climbing once more. This time it’s a long haul up but at Mile 2.3 you top off at 1,140 feet where a short spur leads right to the edge of the ridge. At one time this spot was a clearing with a 180-degree view of the rugged terrain leading to the Au Sable River. But Mother Nature has since taken over and now trees full of foliage block the view from late spring to late fall. The main trail skirts the top of the hill as it makes a sharp turn, then begins a half-mile descent off it. You bottom out at a clearing, where you skirt a marsh with a pond, a good place to search for beavers and other wildlife. You then follow a level route to post No. 12, reached at Mile 3.7. The post marks a junction where the trail to the north (left) heads for No-Name Lake, the trail to the east (right) leads to post No. 13 and the Hoist Lakes. Head north (left) for No-Name Lake. The shallow lake is quickly reached and if it's a dry summer there will be not water at its north end, but an extensive mud flat. You leave the lake with no name, climb 60 feet and reach post No. 11 at Mile 4.3. Head south (left) to pick up the easy cutoff spur to Byron Lake. To the north (right) is the trail to post No. 5, 0.8 mile away, and the longer – 7.6 miles – loop to the western trailhead. The cutoff spur passes a couple of small ponds and wetlands where there are signs of beaver activity all around, particularly gnawed tree stumps. Within a half mile you return to post No. 10 and the Byron Lake walk-in campsites. Pack your gear and backtrack the 1.7 miles to the western trailhead if your schedule is so demanding you can’t stay for another night. There are no longer hand pumps for water that are shown on older maps of the foot travel area nor is there a source of safe drinking water at the trailheads. Always arrive with water and a water filter if you’re staying overnight. Backcountry campsites feature fire rings but little else. 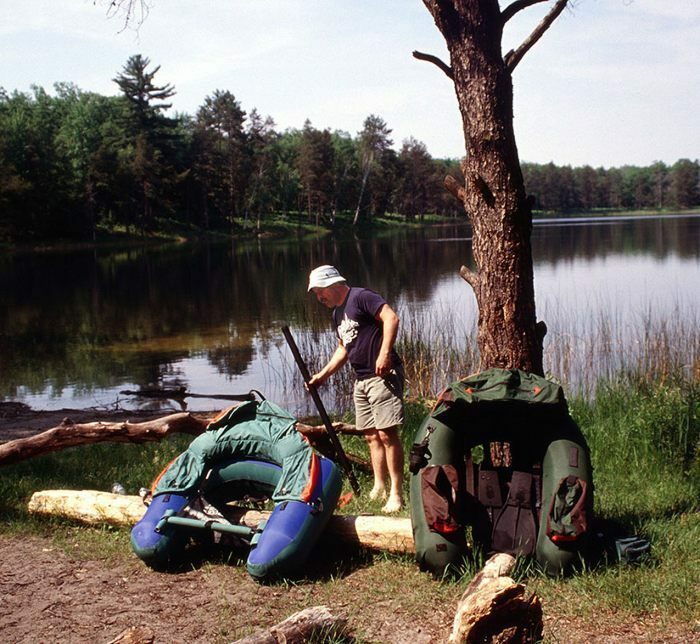 A Huron-Manistee vehicle pass is required to hike Hoist Lakes. You can purchase a weekly or annual pass at the Huron Shores Ranger Station (989-739-0728) in Oscoda, the Mio Ranger Station (989-826-3252) or from a fee pipe at the trailheads. The Hoist Lakes Foot Travel Area is east of Mio, 22 miles west of Harrisville, or a good 3-hour drive from Detroit. If heading north, depart I-75 at exit 202 and continue north on M-33 for 36 miles. In Mio continue north M-72/M-33 for 5 miles and then east on M-72 for 15.9 miles. Head south on M-65/M-72 for 0.75 miles and just past the hamlet of Curran turn right on County Road F-32 (also labeled Aspen Alley Road) and head south for 5.5 miles to the posted trailhead on the right. 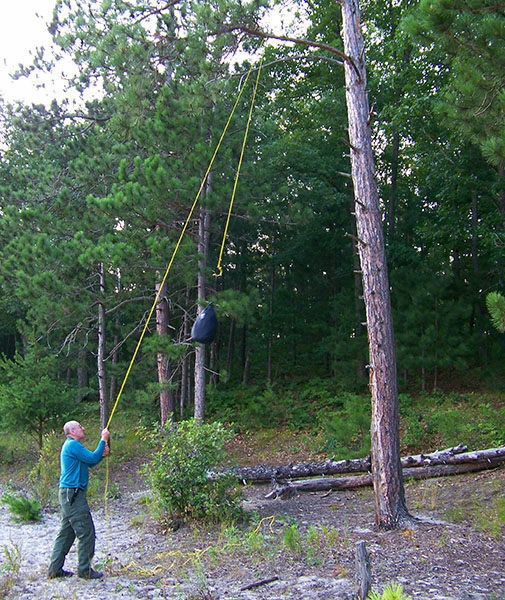 Call the Huron Shores Ranger Station (989-362-8961) in Oscoda or check the Huron-Manistee National Forests web site (www.fed.us/r9/hmnf).